A new 7-story Hampton Inn & Suites should begin construction in May at the corner of Royal and Conti streets in downtown Mobile. 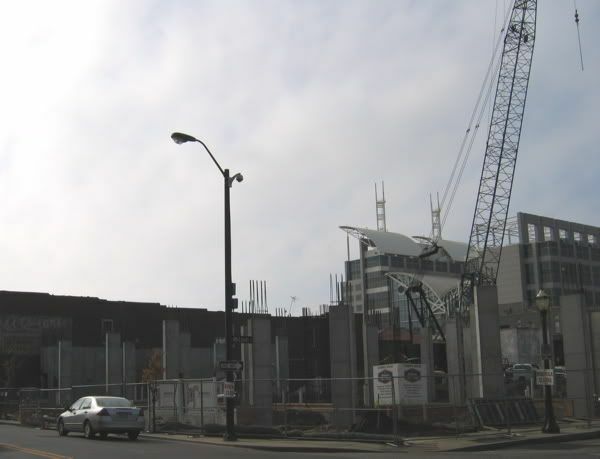 The $15 million hotel, with balconies for viewing Mardi Gras parades, could open in summer 2008. According to the developer, room rates will average $125 to $150 per night. Amenities will include an exercise room, business center, convenience store, meeting rooms, outdoor pool, courtyard and outdoor fireplace. The developers have a contract to buy an adjacent Republic parking lot, which would be turned into a parking deck for hotel guests. Some retail space is planned along Royal and Conti. 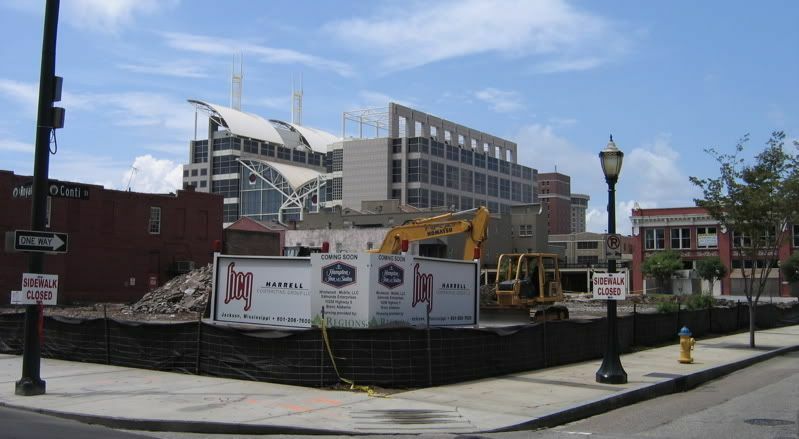 This is a great infill project for downtown Mobile. The hotel is supposed to be built out to the sidewalk like the Hampton Inn in downtown Memphis. I hope the final design fits into downtown Mobile, and that the parking deck is wrapped with retail/office and residential, instead of having an ugly deck front Government Street. Unfortunately not, though I'm not displeased with the design, it's nice to see the respect for the urban location by not planting a suburban hotel downtown. Looks Good! Wish it would have been taller! will they tear down Veets ? Appears to be some Retail under the hotel, something you rarely see with urban hotels. Ok its the middle of may . whats the deal? Can somebody help me out? I'm logged in but when I click the link it tells me I do not have permission to use this feature. I tried to pm Expat and it said I didn't have permission to do that either. Anyone have any ideas? I didn't realize that everyone can't see this. Nimsjus, you're in the Members group now so it should work for you. Try it again. 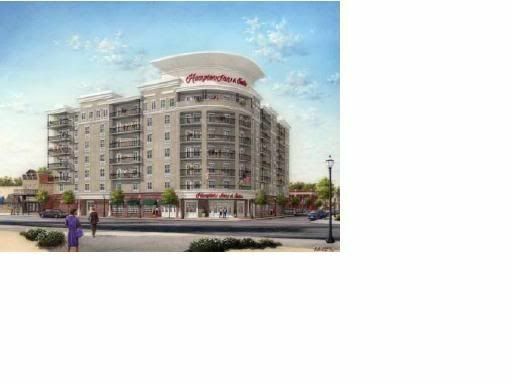 The 150-room Hampton Inn is scheduled to open on December 5th. The hotel will include a convenience store, two conference rooms, an exercise room, an atrium for the breakfast area, an outdoor fireplace and a pool. A Quiznos restaurant in the hotel will feature outdoor seating on Royal Street. The opening date for the new Hampton Inn & Suites was delayed until December 26th. 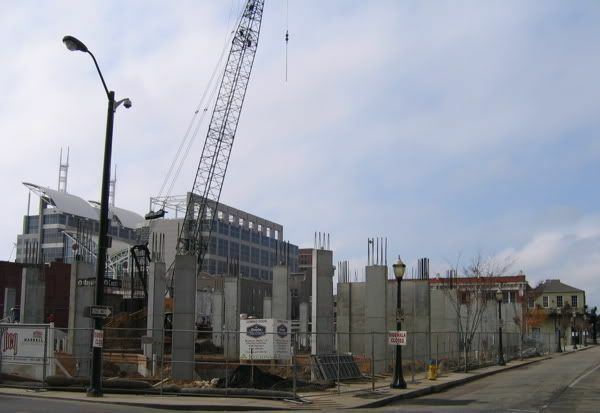 does anyone have an updated pic of the downtown hampton inn construction?